Failed Apple products | WhatPoll? In the years since Apple’s inception the company has created some of the most amazing devices the world has ever seen. Apple, however, is not without it’s flops. Most of these failures lead to much better products down the road, and all of them are interesting in their own ways, but they do show us the company isn't perfect at everything! I'm surprised they didn't get eWorld to work that could have been great, maybe could have transformed into an early social network. The Pippin doesn't look to good, no wonder no one bought it. The Pippin was designed by Apple and manufactured by Bandai in 1995. Apple's aim was to create an inexpensive computer to play CD-based multimedia games, however the timing couldn't be worse as it was released in a market already dominated by Sony Playstation, Sega Saturn and Nintendo 64. It cost $599 dollars back in 1996, which adjusted for inflation, is a fair chunk of change! Only 42,000 of these ill fated devices were sold before a silent death. Way back in 1983 Apple released the Lisa, which was one of the first commercial personal computers to have a GUI and a mouse. The Lisa operating system featured cooperative (non-preemptive) multitasking and virtual memory, then extremely advanced features for a personal computer. One of the main reasons for the failure of Lisa was its astonishing price of $ 9,995 (This would be over $20,000 today). Launched in 1994, the QuickTake was one of the first consumer digital cameras available. The $600 camera was capable of taking photographs at a whopping 640×480 (which was great for the time). Apple missed the boat, however, as Kodak, Fujifilm, Canon, and Nikon entered the digital camera market at much the same time. Each of those 4 companies were already associated with photography…Apple wasn’t, and consumers let the QuickTake fade into obscurity. In 1994 Apple partnered with AOL to develop eWorld which was intuitive and easy to use and included services like email (eMail Center), news, and a bulletin board system (Community Center). Users of the service were referred as 'ePeople'. eWorld was considered innovative for its time, but it was expensive compared to other services and not well marketed, and failed to attract a high number of subscribers. The service was officially shut down on 31st March 1996, just two years after going live. 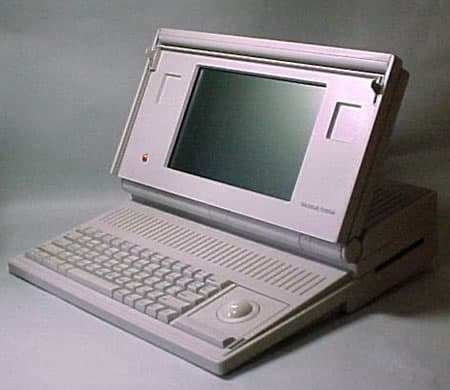 Launched in 1989, the Macintosh Portable was Apple's first portable computer. It featured a black and white active-matrix LCD screen and a full keyboard. It had a price tag of $6,500, which needless to say didn't bode well for sales. After a mere two years of going on sale, it was withdrawn from the market. This product was later replaced with the Powerbook, which was a great bit of kit. Released much ahead of its time in 1993, the Newton (official name was MessagePad) was touted as the future of computing. The Newton was the first handheld computer coined a “PDA”, and it’s influence on the PDA market cannot be denied, but the system itself was a complete failure for Apple. It could fax messages, send e-mail, had applications to organize names, dates, phone etc, oh, and it cost $1,000. Macintosh TV was Apple’s first attempt at Computer/TV integration. This "limited edition" Macintosh TV introduced in 1993 was one of only a few Macs to come in black, it came with a cable-ready TV tuner card, and included a CD-ROM drive. Essentially all the Macintosh TV consisted of was a Performa 520 a built-in 14 Sony Trinitron CRT Monitor that could switch to being a cable ready TV. It was met with excitement, but was discontinued a year later, only around 10,000 were sold. Apple released two U2 special editions of its iPod, one in 2004, the other in 2006. Apart from some printed autographs on the back of the machine, a U2 logo, and a U2 poster, it failed to offer anything different or more exciting over the regular iPod. The main difference appeared to be the additional $30 premium you had to pay for it. This won't go down in history as one of Apple's finest moments, it will be remembered as a cheap marketing gimmick.